﻿ "Free French occupation of the Obersalzberg"
"Hadj Kaddoua had just uprighted Montmirail." Workshop tank Hadj-Kaddoua. An old "Grant" M3 tank from the desert war. Many were converted into a huge tracked breakdown vehicles designated model M2. "Iéna 2 prepares to leave for the Obersalzberg, Ulm in front." The Platterhof Hotel in camouflage. Hitler's Berghof, ruin of Borman's house in distance. Three of Iéna 2's crew talk with Americans by the SS guardhouse to the Berghof. Nearest Philippe Bey-Rozet, middle Gaston Eve, furthest Jean Brissé. RMT line up their Half-Tracks on the Berghof's driveway ready to greet latecomers. L-R Adjudant Albert Parmentier, Jean Brissé, Georges Dornois and Philippe Bey-Rozet on Platterhof balcony. L-R: Philippe Bey-Rozet, Georges Dornois and Adj Albert Parmentier with trophy painting from the Eagles Nest. 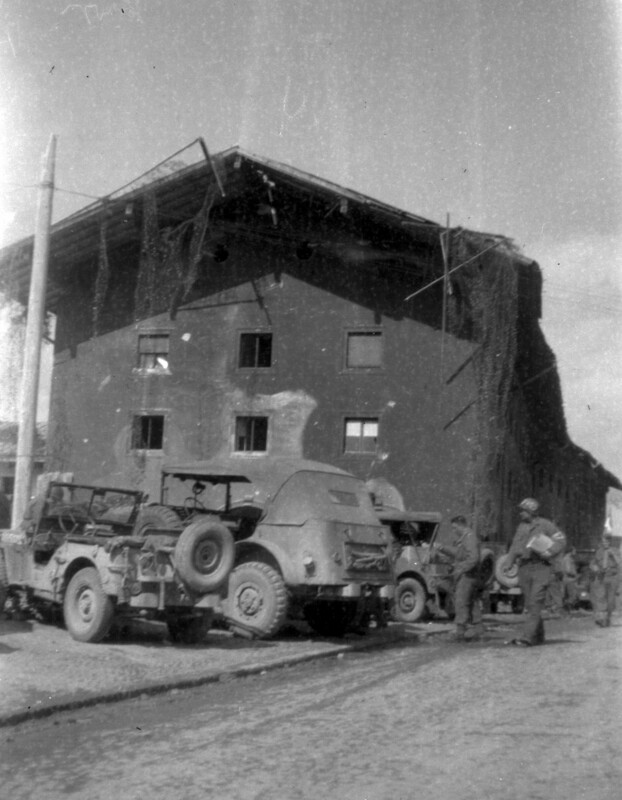 Gaston Eve greets Americans on Berghof's drive with liberated French wine. Gaston Eve says goodbye to Iéna 2 and to a dreadful war. Odette Lampin and Gaston Eve on the garden well at the Pimont family home (Gaston's maternal aunt). At Chateauroux I had the honour to receive the Croix de Geurre from the hand of General Leclerc as a result of our actions at Grussenheim. We then paraded in Paris in Montmirail, which now had two rings on its cannon and on Montmirail's side we had painted "Lt Louis Michard". Etienne Florkowski had become Tank Commander; Paul Lhopital was made Gunner; and Pierre Mengual the Gun Loader/Radio. My co-pilot was always the young Marc Casanova. Ever since we first saw her at Casablanca, Montmirail had never broken down. She had taken 3 hits from armour piercing shells and seen several other close shaves. She was not simply a machine of steel because without her we could have done nothing to help liberate France. 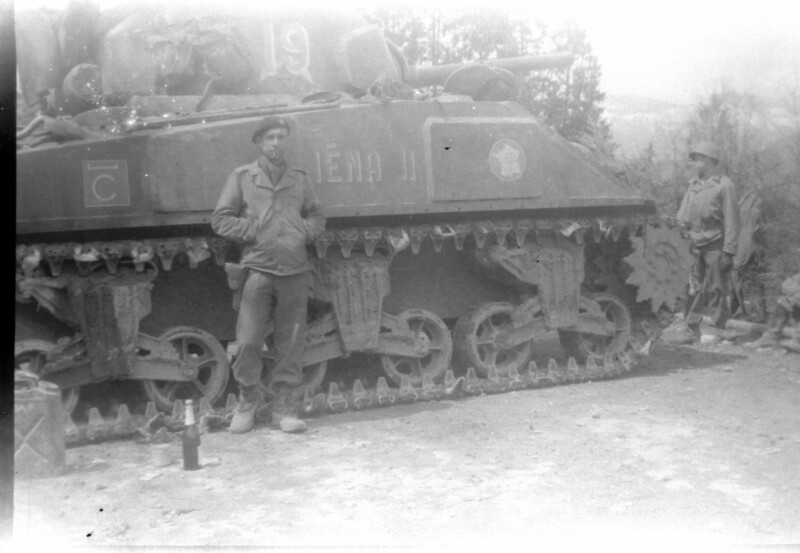 During one of our troop movements we were rolling along on a road on an embankment when I saw ahead of me a section of broken tank track. Even Caron could not have anticipated such a situation. I pulled on both brakes but inevitably, Montmirail swerved to the left and fell, very gently and graciously, onto her side in the field that bordered the road. She over-turned herself so gently that no one was injured. A workshop tank put us back on our tracks but it was a huge job. Just as this was done Captain de Witasse arrived and asked me if I would like to become Tank Commander of Iéna 2. Without hesitation I replied "Yes"! It was nevertheless with great regret that I had to leave my comrades of Montmirail. That tank has always remained in my heart. Before departing for Germany a misfortune befell us. I always wanted to have a very clean tank, especially the engine, which we would clean with petrol, as I always did with Montmirail (which had diesel engines). We placed ourselves on the deck at the rear as I told Amzallag to start the engine running. I was leaning on the motor when it produced a huge fireball of exploding petrol. We were all thrown to the ground and François Jaouen [Of the tank Romilly] who fortunately was nearby, let off the extinguishers. The engine suffered no damage, Amzallag, Bey-Rozet, Beaufils and I were taken off to hospital. I had burns to the face and no longer had eyelashes, eyebrows or moustache and my hair came out by the handful. Odette, to whom I had written, came to see me in hospital. She passed me by, she couldn't recognise me because my face had turned completely black. When she came back past my bed I tried to embrace her but this only frightened her away, even my lips were damaged. After about 20 days Amzallag came and told me that the Company was leaving the next day. The nurses found me a uniform, I left with Amzallag and we returned to Iéna 2. I was no pretty sight and could not wear my beret. In Germany, the first city we crossed was completely destroyed. Our advance was very rapid and almost non-stop. The mobilisation and supply of the DB was excellently organised. All of a sudden a great deal of snow began to fall and it became quite cold. I asked myself if we would once again fight like at Grussenheim. I was full of apprehension, yet there was no fighting. The Germans all along the route were surrendering in entire units. One time we entered a house to ask for some sweets. The sole occupant of the house was a lady, forty-ish, nicely dressed and very German. She told us she didn't have any sweets. One of us went into the larder and found 2 beautiful jars which he brought back. He poured one over her head and we ate the other one. At a siding near Munich we found Goering's armoured train. It was very beautiful and well designed, having a beautiful wine store, also some very beautiful bedrooms, a restaurant, a salon, conferences rooms, bathrooms. The Occupation of the Obersalzberg. We arrived at Berchtesgaden in the afternoon of 4th May 1945 and on arrival we were allocated chalets occupied by very well off German families. With the great dignity General Leclerc had asked us to maintain in our conduct in Germany, I asked the occupants of the chalet in which the crew were to eat and sleep, in my few words of German and a few words of English or French, to provide us with some food and beds. I also said that I needed to see immediately all who occupied the chalet whether of the family or its servants and employees. This was quickly done and on one side the family and its employees stood and on the other I and the crew. I said I was the "Panzer Fuhrer" knowing that Germans eulogised their own tank commanders and asked if anyone spoke French or English. Mercifully someone spoke good English. I said very briefly that I and my crew hated all Germans for the war they had caused. I said that they and their home would be respected by the crew but that I expected all that I asked to be done without question. I said that any weapons in the chalet must be produced now but that we would search the house thoroughly in any case. It was all a very strange experience but, it was as far as we got. 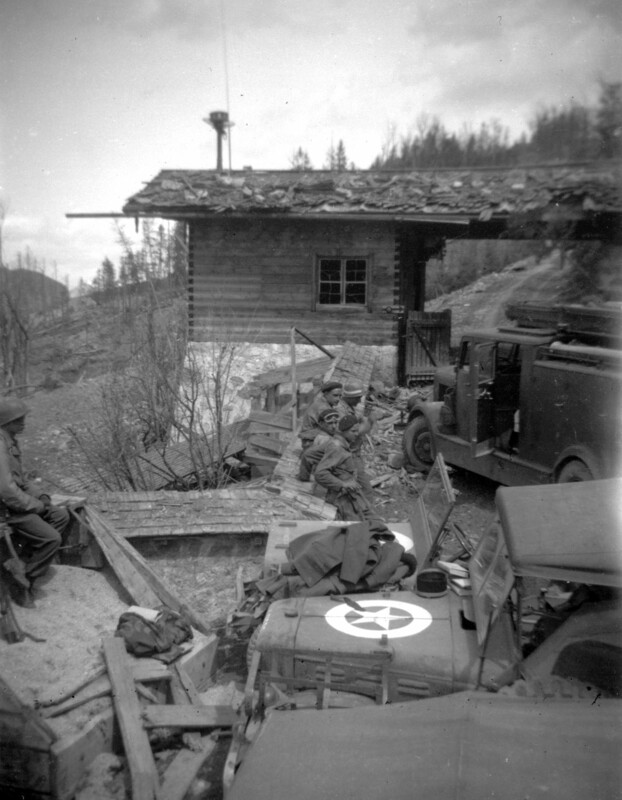 We had no food and no beds yet as an officer walked into the room and told me that I and the crew were to go back to the tank with the order that we were to leave with a small group so as to go into the Obersalzberg. The small group [ named "Messiah" ] was made up of about four infantry Half-Tracks [ 2nd Platoon of 12th Company III RMT ], the tank Ulm [ from 2nd Platoon 2nd Company 501 RCC ] commanded by my friend Zoran Eugène Séleskovitch and my tank [ from 1st Platoon 2nd Company 501 RCC ] which I had commanded for the last three months, having before then been of the crew of Montmirail. I have a photo of the Iéna 2 as it prepared to leave Berchtesgaden. I do not remember who commanded the small group. It was neither Séleskovitch or me as we were only Sergeants [ Other accounts indicate it was Commandant de Florentin of the III RMT ]. 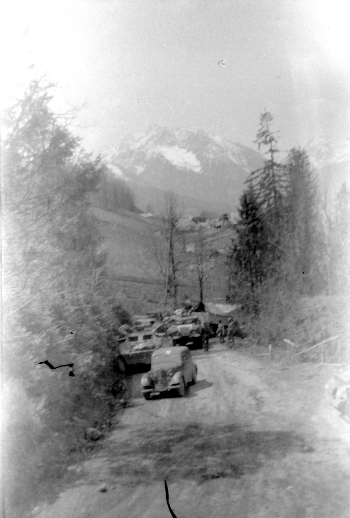 The group left Berchtesgaden in combat stations, as we had no idea what awaited us along the road or in the Obersalzberg. Ulm had been named lead tank and my tank was immediately behind it. This was always the tactic for first and second tank. We knew from hard experience of the possible fate of the first or second tank but nothing would have led us to give up our place that day. So we put our lives on the line for what was to be, thankfully, the last time. The departure from Berchtesgaden was by a road which snaked in open country along the base of a very substantial mountain range. After a certain lapse of time, which I cannot now specify, the road entered the forest which covered the whole mountain from then onward. From time to time the Ulm, which I followed very closely in case of combat, was obliged to leave the road for reasons which I do not remember. I followed Ulm into the forest and we rejoined the road further up. The climb into the Obersalzberg took a good while. About halfway into the mountain I saw Ulm slide sideways into a very deep trench from which he was unable to come out. 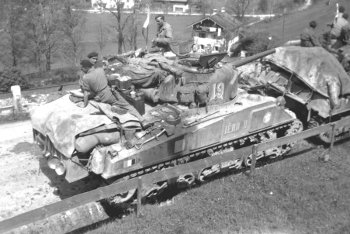 This happened either along the road or in the forest [ The Ulm's weight collapsed a bridge as the tank was passing over it. Commandant de Florentin ordered the tank abandoned. When Capitaine de Witasse later heard of this he was livid! ]. I only remember that the tank was surrounded by trees or had trees close to it. 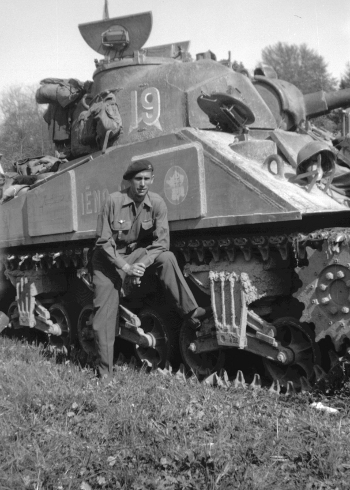 I stopped Iéna 2 immediately but I must have had orders to carry on and lead the group, as I did not leave the tank to speak to Séleskovitch. Tank and Half-Tracks went past the Ulm to continue the climb and reach our objective. A great pity for Séleskovitch and me who had had such a long road together since leaving Liverpool in August 1941 with the Second Tank Company of the Free French Forces and our first commander Capitaine Ratard. Even more the pity in view of the very close and devoted friendship between crews. Séleskovitch and I were the only two out of the ten crew members from the original volunteers! When nearing the summit of the last of the mountains I noticed that trees alongside the road had been demolished by what were clearly bomb explosions as there were a good number of bomb craters. Further up the road forked. The road straight ahead had across it a leaning metal gate and at the side of the gate a sentinel's hut. The other fork, which turned sharply to the right, was the only one I could take. Mercifully there was still no one to engage us. Immediately after taking the bend I saw that the whole area each side of the road had been severely bombed as had two or three chalets which were the first we had seen on the mountain so far. There were many bomb craters. I learned later that the RAF had bombed in April. Further up the road took a left turn and as soon as we took the turn we found ourselves at the top of this part of the mountain which went on even further. At that moment I saw immediately to the left of the road three or four large buildings. I think all had no bomb damage. On looking further back, behind these buildings, I saw a very big chalet severely damaged and partly burnt. Further back to the left and right of this building I saw four or five smaller badly damaged chalets. I stopped Iena 2 beside the largest of the buildings on the left-hand side of the road. The building was intact. Our infantry were there too. I do not remember what orders I was given but it was probably to check the building to make sure no one was in it, as this is what we did. We never relished checking buildings but by now we were experienced at kicking doors open before walking into a room. Four of the five crew members came out of the tank, the fifth having to guard it. The double main door of the building must have been unlocked, as I do not remember that we had to smash it. We found ourselves in a hotel lobby or hall. Everything was impeccable with sofas, armchairs, coffee tables and the like in place for guests. At the back of the lobby was a reception counter and on reaching it we found we were in the Platterhof Hotel. Going through a door near the counter we found ourselves in a large restaurant. There again tables, chairs and so on were perfectly laid out and everything was very clean. The employees who had been among the last to leave had done their work thoroughly. On going through the restaurant we found ourselves at a kitchen swing door and there we found a kitchen, spotlessly clean with all utensils in place. At the back of the kitchen we found a door which led us to stairs which went down to a cellar. We would not have given our place to anyone when leaving Berchtesgaden and nothing would have made us give up our place now! We found ourselves in a superb cellar with rack after rack of champagne, wines, liqueurs and alcohol of all kinds. Most were French. All the racks were absolutely full and in impeccable order. When we saw all these racks totally intact the crew got confirmation that no other allied troops had been this way and that we were the first to arrive in the Obersalzberg, a very special place in history. We knew we had hit the jackpot in the cellar of all cellars. We looked longingly at such bottles as Cordon Bleu champagne and left it all there for the time being as we had to be sure that we were the only occupants of the area, actually known as the Berghof. We went back the way we had come, in order to go upstairs where we knew there would be bedrooms, which for our long-term safety we had to check. All the bedrooms had been slept in by those who, mercifully for us, had not wished to confront us. All the rooms were untidy and the bedpans contained urine and the like, the result no doubt of a hasty departure. 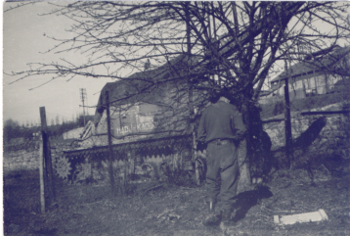 We checked outbuildings of the hotel and went back to Iéna 2, the infantry having checked other buildings. Iéna 2 went back the way we had come to the road with the metal gate and sentinel's hut [ This was the guardhouse for the Berghof. ]. It was not locked so the gate was not smashed. On going through I saw to my right the large chalet partly damaged and burnt, which I had seen from the Platterhof. I recognised it easily from the pre-war newsreels which I had seen in cinemas as Hitler's official residence where he had received visitors from all nations with such panache and at times with complete contempt in view of his very great power in those years. The main stairs in front of the building had been demolished. The front windows including those on the front balcony were smashed by the bombing and there was much damage at the side of the building. The surroundings, which in newsreels I had seen to be beautifully flowered, were a desert. We walked up to the main entrance which now had no door and saw in front of us stairs to the first floor. On turning to the right at the top of the stairs we found ourselves in the huge reception room which again I had seen in newsreels. The walls and ceilings were still intact but all the walls were bare of paintings and the like. So it was that, having seen the newsreels of 1939, a tank crew made up of Gaston Eve, Jean Brisse, André Beaufils, Philippe Bey-Rozet and Georges Dornois reached there on 4th May 1945. We checked the ground floor, which was accessible only to find there the furniture, paintings and many things which had been moved from the large room after the bombing I assume. We left everything as it was, great as the temptation was. We went back to Iéna 2 to rejoin our RMT comrades at the Platterhof which, inevitably in view of its contents, was to be our overnight headquarters. We now knew that the 40 or so of us were the only occupants of the Obersalzberg and that we had survived the war as the end was only days away. There being no Germans at all in the area we could not ask for food and yet again it was American K Rations which, although monotonous, were good and nourishing. Having set up a guard outside the Platterhof for our security a few of us went down for a few bottles with which to help down our K Rations. Yes we came back with Cordon Blue champagne, a few bottles of vintage wine, liqueur and brandy. A magnificent way of ending a war in the very place where Hitler and his whole team had lived. But alas what could have been four and a half lovely years of our lives had gone in a merciless and dreadful task. We drank very modestly knowing that we might need to be clear headed. My fellow crew members were two to four years younger than me, having replaced dear friends along the way, and I was still only 24. All of us still drank very little. When night fell we organised a guard duty which had been our lot so often among the five of us so far as the tank was concerned. One of us was outside the tank on guard while the four others slept as best they could in their positions so as to respond to any emergency. It was to be the last night we slept in a tank! We woke up at dawn. We knew that the 12 to 14 hours the 40 of us had spent alone in our domain at this very very special military moment would soon end. So it was another breakfast of K Rations and probably a "Café Cognac". Knowing from past experience, on a much more modest scale, what would very soon happen to that magnificent cellar our first task was to go down to the cellar to choose the very best bottles and to turn Iéna 2 into a cellar of shells and bottles, so as to have some good meals for a few weeks. Sadly the number of bottles had to be shared with other crews who, having stayed in Berchtesgaden got their own back for not getting to the top, got a good share of all but the bottles which we had successfully hidden in a shell rack. We were right in thinking the cellar would quickly be cleared. The news soon spread. After the lorries of the Regiments of the Second Armoured came lorries from the American divisions, but by then the 2nd Armoured had done a very thorough job, using all the initiative that could be mustered in such a vital task! I saw the magnificent cellar 24 to 36 hours later. There wasn't a bottle left in it except for a good few bottles smashed in the urgency of the moment. 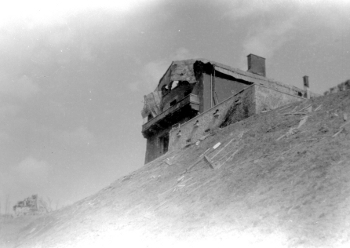 The magnificent cellar had become a typical example of another side of a soldier at war. We also knew at breakfast that morning that this sacred place for the Nazis would soon have to receive many French and American visitors as by then we knew that all the misery was over as far as we were concerned. To make sure the many visitors knew Iéna 2 and a few Half-Tracks of infantry had been first in the area we lined up the tank and half-track alongside the road leading to the main gate past which everyone had to go. We assumed that all would see our tank and the Cross Of Lorraine and the emblem of 2nd Armoured. I have a photo of Iena 2 and me with a bottle of champagne at this emplacement. Had we not been carried away by the moment we would have realised that the last thing members of armoured divisions do is look at tanks and Half-Tracks, since that is what they see 24 hours a day. And so it is hence on the 16th November 1995 my writing these words. On the 5th or 6th May, probably 5th May our comrade Adjudant Albert Parmentier joined us, no doubt on orders of Capitaine De Witasse, as I was only Sergeant, but the highest graded member of the company on site. 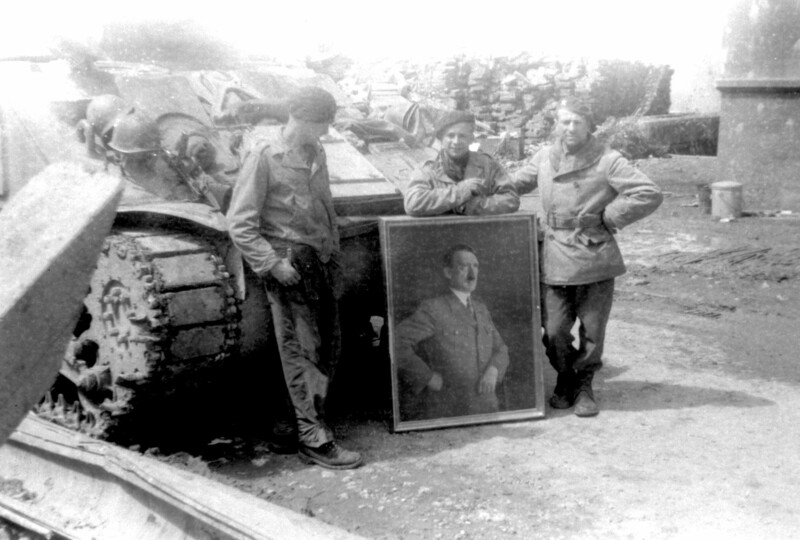 [ Adjudant Parmentier as a wonderful gesture, brought along the tanks Eylau and Essling from 3rd platoon of 2nd Company in honour of their Commander, Lieutenant de la Bourdonnaye, who was killed at Grussenheim. It was probably by means of these two tanks that Captain de Witasse effected the rescue of the abandoned Ulm. ] Many French and American senior officers and commanders would inevitably go by. They did not notice us either apart from two American majors. We had a drop of champagne together! In our first day on the Obersalzberg we found in one of the chalets a superb oil painting of Hitler on one of the walls of a chalet. We took it with us. One of the crew lit a cigarette burnt a hole in Hitler's mouth and reversed the cigarette and put it in his mouth (I have a photo of the oil painting in front of the tank). 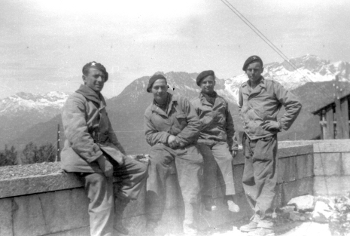 When I heard on the radio on the 8th May that the war was over we were still in the Obersalzberg. We had passed some agreeable days there and I spoke English with some Americans for a change. We had been for each other good companions of the American Third and Seventh Armies. These last few days the crew did not mount any guard and slept in the Platterhof Hotel having emptied the bedpans in the rooms we occupied. The most striking thing about the whole area, which housed Hitler and his immediate team, was the total respect of the Germans for it. There were many valuables in the properties. Everything was left in place. Believe it or not the crew of Iéna 2 did the same thing! 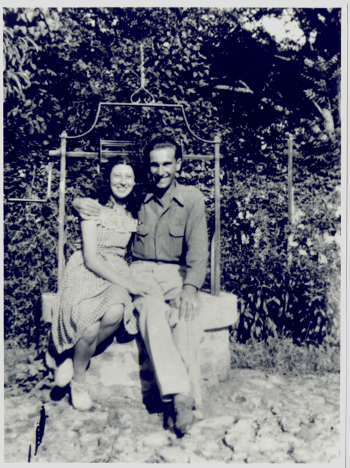 When I came home in July 1945 I gave my mother the only thing I had taken from the Obersalzberg. No it, wasn't a gold necklace of which there were many gold items of all kinds. It was a large towel embossed PLATTERHOF. She was actually very pleased with it and showed it to many friends. On 9th or 10th May Iéna 2 went down to Berchtesgaden where we found our comrades of the 2nd Tank Company. We resumed life together quite normally. So many things had happened to us that one more or one less didn't matter and nothing was said. But for the tank Iéna 2 and its crew of the 2nd Tank Company of the 501st Tank Regiment, the 4th May was a fantastic day. Fate decided that of our 2nd Armoured Division and of all allied armies, that Iéna 2, our tank, was the first allied tank to reach this unique and historic place. There had been all the official residences and some private residences. But it was there that Hitler had prepared this terrible page of history in the 1930s. What I have written is dedicated to Claude Phillipon, Daniel Renou and Lucien Asplanato, killed in the first Iéna on the 16th November 1944 at Petitmont in the Vosges. All never saw their 22nd birthday. Gaston Eve, 16th November 1995. About the 10th of May we performed a major redeployment lasting a day and a night and arrived in the small hours, exhausted, at a very beautiful German village close by a magnificent lake [ The Ammersee ]. In the neighbourhood we found a hospital with German military casualties. We re-entered France, but I became unwell, losing both physical strength and mental will. I have always thought that this was a reaction to all we had suffered and endured. It was at this time I was asked to volunteer for Indo-China. I had no more will to fight. At the time of our demobilization the 30 to 40 of us remaining of the 120 FFL of those earliest days who were still with the company contributed the necessary sum to make up a final meal together before returning home. Not all those absent were dead, several having been terribly burned or wounded. Not one of those fine and dear comrades who joined at Sabratha and who went through so much with us was invited, not even Captain De Witasse, who did us the honour of visiting us at the end of our meal and speaking to us warmly. It was inevitable that that which had been forged first should emerge again last, and that we should meet once more in that spirit putting all else aside. Of our officers none could be there. Of our NCOs I saw only Henri Moulé because Adjudant Raveleau had his feet frozen at Grussenheim and hadn't returned. The atmosphere in that little French restaurant, served by French girls, was fine until the moment when toward the end of the meal a comrade asked for silence for our chums who were no longer with us. We had only been little boys of 17 to 20 years age in 1940/41 and in that moment all the misery of losing such fine friends took hold of us. Silence for minutes was impossible, there were muffled sobs and I felt the tears running down my cheeks. In such a circumstance maintaining silence was unbearable and a comrade began singing a marching song and little by little we joined in and it passed like that. It wasn't a very pretty song, the words were very filthy, but without it our sorrow would have overwhelmed us. There seemed no other solution, yet I have always wondered what the ladies who were serving us thought of us. I hope they understood! Towards the end of the meal Captain de Witasse, who gave us the finest example of bravery and fidelity, came and rejoined us and we passed our last half hour as "Tankers" with him. He then thanked us and this was a great moment for all of us. Afterwards I went out into the vehicle park and took myself over to Montmirail where I passed 2 or 3 hours at my post as driver going over a heap of memories, re-living some moments with Lieutenant Michard. I didn't leave her until the lorries came to take us away. I said goodbye to my comrades. My little Parisien was waiting for me at Sainte Lazarre Station. She accompanied me to Rouen to stay with my uncle. There was no engagement or request for marriage, yet I knew this was for always and I asked Odette to come join me in England when I had got the necessary papers. Arriving at Dover, I began tackling the obstacles. There was I, in French military uniform with papers not in order. England was never welcoming if your papers were not correct. I was unable to go to my train, meanwhile my family were waiting for me at Victoria Station in London. My father, who had never minced his words, made a little noise and I was allowed to go home on condition I report to the authorities. I went back to the British airline that had guaranteed me my job when war was declared. Odette came and rejoined me. We were married on the 10th October 1945 and this, for me, was the perfect ending. My most profound memory and that which I recall most often is of Lieutenant Michard. I remain proud of England, my country, however I hold a very deep affection for France and the decision I took in 1940 was the finest of my life. When I returned home in 1945 I had nothing but the Croix de Guerre, given me by General Leclerc and some words of thanks from Captain de Witasse. That was Perfect! Of all the awards I have received in my life, that which has given me greatest pleasure was the thanks received from General de Gaulle on the 17th September 1945. Please accept my apologies for any gaps or imperfections in my account. Nevertheless I wanted to write some words in honour of the 2ème Compagnie Autonome de Chars de la France Libre and of the 2ème Compagnie de chars of the 501ème RCC. My thanks to you, my Captains ! Engaged as volunteer 1160 in the Forces Françaises Libres, London, February 1941.